Today will be very interesting. This is the first time that gold and silver have risen in SHANGHAI overnight since the June re-hammering, and have not been IMMEDIATELY over-shorted below $1300 and $20 respectively. If they allow it to close above these numbers, the game looks over. This means that the bullion banks can no longer afford to support the dollar, OR they are waiting to let it go up and then hit it again maybe once more with whatever they have left. However, they already have SO many shorts outstanding, that would be a huge additional risk. They don’t have enough physical gold to keep the game going, so if this isn’t it, there is only one more shot to delay the inevitable…which is all they have been trying to do anyhow. They know it’s over. 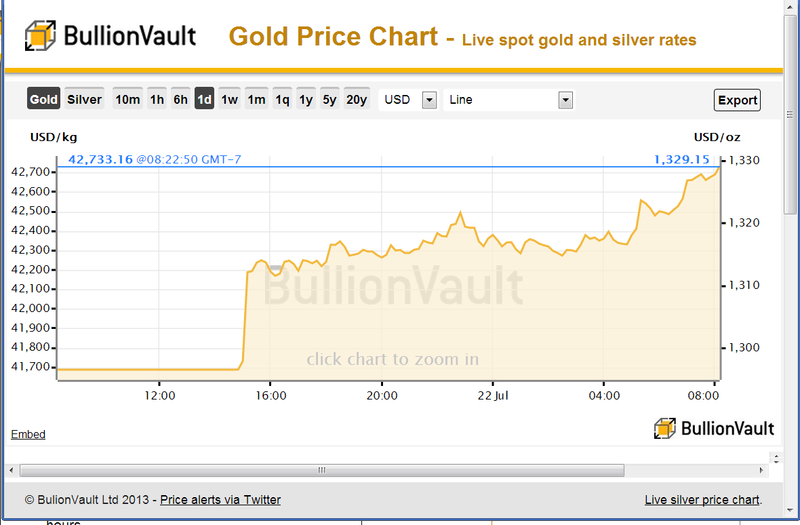 That’s why all the recent movement of bullion. They didn’t expect the Chinese to pull out so much out of the closed system game they had. They stand to lose their entire deposit if the market moves just 5%!!!!!! To $1365. When that goes, the dollar has lost its gold underpinning. This is happening much faster than the Fed wanted. If bond yields also move today, it will be more interesting. If the Dow keeps ignoring this, it will rise some more before it too crashes hard. Who knows, maybe QE will accelerate and the stock players will pretend a little longer. Ben left that door open, he said. The bottom is here. If you are thinking of ever buying any more, this is as low as it will ever be. Prices will move fast. I expect that the next resistance level of 22.40 might even be tested today. If it breaks through there, it’ll get interesting quick. Any market which allows these kinds of margins and leverage is BEGGING to be manipulated. In the stock market, 2:1 is permitted… but 16 , 17, 22 to one? CFTC is impotent. Either these guys expect to be bailed out by taxpayers if they lose, or they have very deep pockets. I can’t figure why these hedgers are ALWAYS on the wrong side of a market. The commercials went long weeks ago. At the $1900 peak, the speculators were LONG. If they can’t read charts, they should read the writing on the wall! Time to buy more physical.